The fact that we deliver IT managed services gives us a competitive advantage when it comes to litigation support and electronic discovery because we know technology. ITAcceleration has been supporting small, medium and large educational, corporate and private clients in the Philadelphia area and nationally since 2002. Litigation support and e-discovery involves collecting, analyzing and preserving massive quantities of complex and distributed data, all while under strict court orders and counsel time and budgetary constraints. We manage large quantities of data on a day-to-day basis. We have tools that allow us to quickly access data regardless of their medium or location. We can do it faster and more efficiently than the competition. 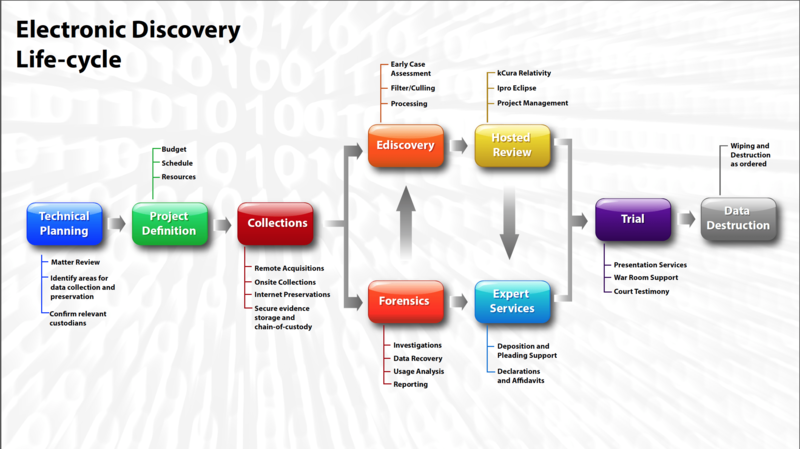 Our electronic discovery life-cycle (shown above) is comprehensive and thorough, covering everything from initial scoping and planning through court testimony and data destruction. Our methodology has been around since 2002 and is a recognized industry best practice and standard.